Sports Interaction is one of the biggest online betting platforms, very famous in Canada. It was created in 1997 and has since tried to boost it online presence with very attractive betting offers. Services of the site have been ever changing, and the managers of the platform always try to keep their clients entertained with new bonuses. Marketing events are frequently updated, and the odds are one of the best in business. This been said the site has ranked easily in top 50 of the best bookmakers in the world, overpassing many established brands in the bookmaking industry. This is mostly because the site has earned the trust of an enormous amount of loyal users that visit it daily. 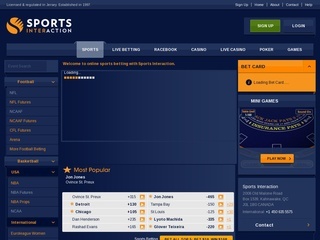 Sports Interaction has one of the most eye-catching interfaces in the modern online bookmakers world. Keeping it simple and clean is what strikes you from the beginning but make no mistake the site has enough depth in odds to blow your mind. The deep blue color will ease the strain on your eyes. The speed of the platform is excellent, and you will not have any problems finding the wager you look for and the sports that interest you. All of this has a purpose, to rival all other sites that clutter themselves with useless information and complicated menus. Another highly valued by users benefit is that the site is quick on all platforms. You can access it via desktop, Ipad or Android device, and your experience will not be bothered by a slow connection. Let us talk a bit about the betting selection. It is very rich with a lot of information available about scores, betting trends and overview of the event. Sports offered are Football, Basketball, American Football, Baseball, Hockey, Aussie rules, Cricket, Curling, Darts and many more. The bookie offers a casino and live casino options where you can find most of the regular casino games like Poker, Baccarat, Roulette, and Blackjack. Markets are also available for entertainment events such as The Oscars, The Grammys, and The Emmys awards. This platform offers an enjoyable experience for its clients, and many have already acknowledged it by creating an account. 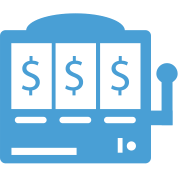 You can be sure that with all the effort the creators have put on the site you’ll find that there is a wide selection of wagers you can choose. They have made sure every major event in the most famous sports have all the odds you need. The odds format is decimal. They have spreads, money lines, and totals. 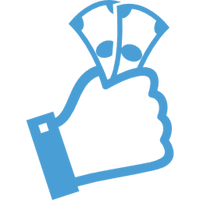 Famous football bets like over and under, double chance, Asian handicap, draw no bet, half-time/full-time, and others are supported. For basketball, there are over and under spreads, first half-time winner and many more. Licensed and regulated in North America the bookmaker has dealt perfectly with all customer issues that bug most of the betting sites. Secure SSL connection is a must these days for online bookies, and you’ll be glad to know that the site has it. They have set a goal to respond to every customer email within four hours, which is impressive for such a popular site. They also have a live chat support system where you can quickly get in touch with an employee and get an answer to your questions. A toll-free phone number is conveniently placed in the “Contact” section if you prefer that method of communication. The company is very active on Google+, Facebook and Twitter, which is another comfortable way to communicate with their employees. Everything about the customer support speaks of high-quality and dedication to the clients. Sports interaction is quite versatile when things come to depositing methods. There are no deposit and withdrawal fees for this site, which is very nice. Some deposit methods are available with the easiest of them being via credit card. You can also use bank transfer, direct wire transfer, and other famous methods. Minimum deposit fee is $20, and minimum bet amount is 1$. For money withdrawal, you can pretty much use the method you have transferred the funds into your account. Funds will be sent to you the next business day (if you have chosen the registered check via courier) or 7-10 days (for e-check) which is quite faster compared to most bookmakers. All the sign up bonuses are limited for players from Canada. The site offers a first deposit bonus to all new members for up to $200 (deposit $100 and get $100 bonus). Rollover requirement for the bonus is to bet the amount ten times. Yes, the offer isn’t optimal compared to another site in terms of rollovers, but the amount is worth the effort. Once you have made an account on Sports Interaction it’s best to subscribe to their e-mails. This is the only way you’ll be sure you’re not going to miss the next bonus offer they suggest. They don’t usually broadcast the offers on the site, so keep a lookout in your email for new messages from the bookmaker. The site tries to keep their clients entertained all the time, so they try to keep their promos and bonus offer updated. During NFL season, you’ll find some fun bonuses on betting lines. Their NBA “teasers” are also fun and worth taking a look at for sure. 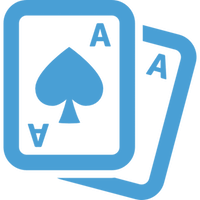 Also, they try to keep their casino and poker promos with special offers – currently there is a 100% Poker Bonus up to $600. Don’t hesitate to check the site, make an account and bet effortlessly on great odds while following your favorite sports.